You are here: Sewickley Public Library > Events & Programs > Recent News > News and Programs > World Affairs Council of Pittsburgh Presentation: AFTER THE FALL OF ISIS: WHAT COMES NEXT? 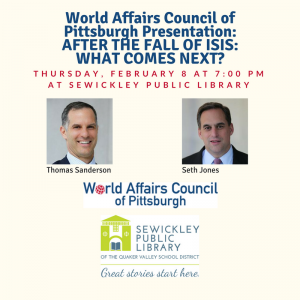 The World Affairs Council of Pittsburgh will host Thomas Sanderson and Seth Jones at the Sewickley Public Library of the Quaker Valley School District on Thursday, February 8 at 7:00 PM. The topic of the presentation will be AFTER THE FALL OF ISIS: WHAT COMES NEXT? Mr. Sanderson and Mr. Jones will cover the recent advances against ISIS, its new phase as an insurgency, and the threat posed by “foreign fighters” that joined ISIS and al-Qaeda on the Syria/Iraq battlefield. Please Register for this Presentation HERE. Thomas Sanderson is a senior associate and the co-founder and former director of the CSIS (Center for Strategic and International Studies) Transnational Threats Project. He investigates terrorism, insurgency, criminal networks, global trends, and intelligence issues. Seth G. Jones holds the Harold Brown Chair, is director of the Transnational Threats Project and is a senior adviser to the International Security Program at the Center for Strategic and International Studies (CSIS). He is also an adjunct professor at Johns Hopkins University’s School of Advanced International Studies (SAIS). 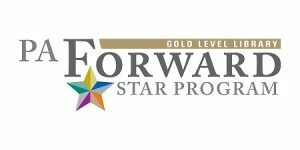 ← Never Miss A Sewickley Event Again!